Mischa Lakirovich, started playing the violin when he was four years old and played his first recital at the age of five, studying with his father, Mark Lakirovich, in his hometown of Brisbane, Australia. From the age of six, Mischa has performed and recorded throughout Europe, Australia and the United States, even appearing in a private concert for Pope John Paul II at the Vatican. 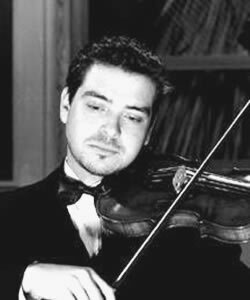 By the age of 13, Mr. Lakirovich had appeared as soloist and concertmaster of the Stoliarsky Chamber Orchestra in over 20 European cities and completed three solo recital world tours. Young Queenslander of the Year, Mr. Lakirovich is a graduate of the Juilliard School, where he earned his Bachelor’s and Masters Degrees. He is the recipient of the Dorothy DeLay Scholarship and the Juilliard Alumni Scholarship. He was also awarded the Itzhak Perlman Foundation Scholarship for the Aspen Summer Music Festival. A frequent soloist, conductor and concertmaster, Mischa has performed with the SBS Symphony, Southfield Symphony, Ann Arbor Summer Symphony, Grosse Point Symphony, Golden State Pops Orchestra, Torrence Symphony and the Young Artists Orchestra in Aspen, Colorado. He also appears frequently as Concertmaster of The New England Symphonic Ensemble performing over a 100 concerts in Carnegie Hall. Mischa Lakirovich has made a number of US and international recordings and live performances on Radio and Television and has appeared on the Fox TV networks, the National Australian Broadcasting Corporation (ABC), music video with Il Divo at Paramount Studios, recordings on Atlantic Records and Soul Surfer Records, as well as direct broadcast on the Radio Vatican. Mr. Lakirovich was recently teaching violin, conducting string orchestra and coaching chamber music at the Lucy Moses School at the Kaufman Center in New York and has been faculty at Brooklyn College, Special Music School of America, French-American Conservatory of Music, and a Technique Associate for the studio of Dorothy DeLay at the Juilliard Pre-College. In 2006 he co-founded the Irvine Young Artists with whom he performs regularly and is currently the Music Director and conductor of the NCC Chamber Orchestra in Los Angeles.